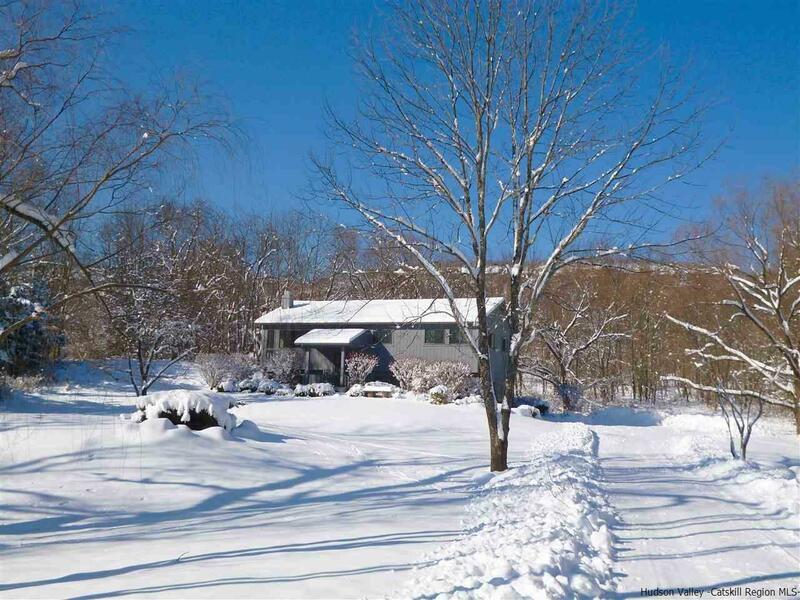 Updated, sunny, comfortable and move-in ready, this house is located on one of the most picturesque country roads just 10 minutes to the Village of New Paltz. In the shadow of the cliffs, enjoy cycling, running or leisurely strolls right from your own front door. Hiking, rock climbing, and skydiving are just down the road - an outdoor enthusiast's paradise for sure! Or perhaps you enjoy relaxing at home by the fire with a good book alone or surrounded by extended family and friends. The versatile layout of this home offers two full living quarters. The choice is yours to use as one large single family residence or a home with an accessory apartment. The in-law set up lends itself to an affordable option for multiple families or generations to live cooperatively. This peaceful oasis on the hill affords a sense of privacy, and comfortable, rustic living spaces. Multiple configurations are possible to suit your lifestyle and needs. The upper level offers an open living room with warm wood, wide board floors and vaulted ceiling, blue stone hearth fireplace, slate tiled dining area and sleek, efficient kitchen with custom cabinetry, granite counters and stainless appliances. 3 bedrooms and a full bath complete the main level. The lower level can be closed to the upstairs for mother-daughter units or enjoyed as a family room, summer kitchen and office, studio or auxiliary use area. The house is sited on one of the loveliest acres possible, set well off the road and enjoying peaceful vistas from all sides. A great yard for pets, children and gardening plus a deck off the kitchen and dining area for year round barbeques.